Early March brought a strong debut album by Seattle’s Delvon Lamarr Organ Trio, featuring guitarist Jimmy James, drummer David McGraw, and of course Lamarr on B-3. This group performs standard organ trio fare, and has obviously honed its own approach by careful listening to masters of the format. Lamarr and company are very good at imitating the grooves of famous musicians, but the group has more than imitative works up its collective sleeves. Each tune on this record is drenched in hot buttered soul, as culinary-themed groovers like “Between the Mayo and the Mustard” and “Raymond Brings the Greens” would suggest. These tracks are riff-based organ jams that feature not only Lamarr’s skillful mastery of the percussive qualities of his instrument, but also skillful manipulation of two chord vamps by James and McGraw and some downright delicious soloing by James (including what sounds like a quote from David Bowie’s “The Man Who Sold The World” on the latter). Organ trios are all about timbre, combining three instruments with myriad layers of overtones, and this group features great tones all around. It’s impossible to beat the rich sound of Lamarr’s B3 contrasting James’s biting guitar tone over McGraw’s colorful palate on the drum kit. No player appears to aim for virtuosic soloing. Rather, the group simmers its grooves, entering and exiting smoothly—the solos end but the jams go on. The record concludes with a retro-soul rendition of Dionne Warwick’s “Walk on By” that sounds like it could have been recorded by the legendary Stax studio band itself. 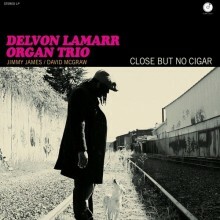 All in all, the Delvon Lamarr Organ Trio doesn’t make any radical changes to the organ trio format, but Close But No Cigar is a worthy entry in this always listenable genre. This entry was posted in Rhythm & Blues, Soul, Funk and tagged 2018, B3, CD review, Close But No Cigar, Colemine Records, Delvon Lamarr Organ Trio, Hammond B-3, Matthew alley, soul music by aaamc. Bookmark the permalink.